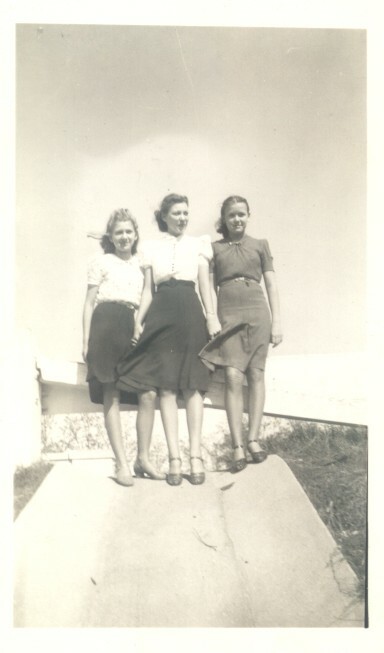 Lola, Lucille and Lee, circa late 1930s to early 1940s. Lucille Hennesy, b. 1920, was the daughter of James Leon Hennesy and his 2nd wife, Lucinda Pounds. Lola and Lea were daughters of Esmond Hennesy and Ethel Simmons Hennesy, Lola b. 1925 and Lea born 1927. I’m guessing this photo was made when Lea was about 13 or 14 years of age and so is dated from the early WWII years, 1940 or 1941. They certainly look dressed in classic WWII style. Photo from Ethel Simmons Hennesy collection.